Whether you need a furnace fuel line bled, a thermostat replaced or troubleshooting of your oil burner or other heating system components... call us! We will determine the nature of the emergency and respond appropriately, with the best technicians and service standards in the area. Repair, conversion, installation and maintenance of heating systems are our specialties. We provide these services to our pay-as-you-go customers at a highly competitive rate. Maintaining your heating system is vital to keeping efficiency high and oil bills low! Having Metrowest Oil Service clean, tune and test your oil-fired home heating system will make sure it's running at peak efficiency, save you money by using less heating oil -- and you'll have peace of mind knowing that your oil burner is not sending carbon monoxide or other noxious gases into your home, and that there are no other safety issues with your oil burner. Click Here to read more about Oil Burner Cleaning & Tune-up service. 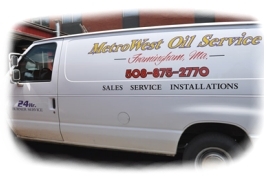 MetroWest Oil Service offers annual heating system service policies. Choose between our Standard or Deluxe policy, and add optional hot water heater protection for total peace of mind protection. Click here to read more about our Heating System Service Contracts. Metrowest Oil Service can inspect, maintain, and repair all heating systems at excellent rates. These services are normally only available from oil companies that require a contract; we offer them to you because we believe that maintaining your heating system is as vital as fueling it. We are also qualified to perform 110-point energy audits to make sure your system in not just simply operational, but delivering the most heat for your heating dollar. Out of oil? No heat? Scary noises coming from the basement furnace? Metrowest Oil Service's technicians are proficient in emergency repairs for all popular heating and cooling systems.